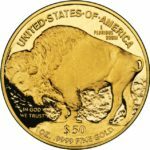 The American buffalo 1-ounce gold coin is another beautiful and iconic American gold coin that makes not only a fantastic investment opportunity but also a great item to own in its own right. There has never been a better time to invest in gold. With many Americans now feeling very uneasy about the falling value of the dollar and many political upheavals in the last year alone painting an uncertain future, there has never been a better time to invest in a physical asset that you know will maintain its value. Gold has and always will be the most precious metal on the planet. There are tiny amounts of gold across the planet and if you gathered it all in one place, it would only be enough to fill a few Olympic swimming pools. This, along with the fact that currency is actually based on it, means that gold is an inflation proof investment. If more cash is printed, your investment will be safe! Gold never loses its intrinsic value and throughout history it has always been one of the only safe investments to retain its value. Investing in gold coin means investing in direct ownership of physical gold. That means there is no confusion about ownership and there’s no fee to pay associated with storage or maintenance. This is your investment that you can keep hold of. The American buffalo 1-ounce gold coin is a very beautiful and iconic coin that speaks to the history of the US. On the tails-side is the titular buffalo, which takes up the majority of the face of the coin and has a strong and imposing presence. The buffalo has a huge hunched back and is looking forward and slightly down, in a pose that looks somewhat reflective and thoughtful. The words ‘United States of America’ and ‘In God We Trust’ are also written on the coin. This buffalo is not just a generic buffalo however but rather a real individual called Black Diamond. On the heads side is a native American in portrait, with the word ‘liberty’ written along the side. That would be James Earle Fraser and is a particularly lifelike rendition. Together, these two designs speak to native American culture and the amazing wildlife of the US. It is a patriotic and proud imagery, as is common on these coins. The American buffalo 1-ounce gold coin is among the most popular gold coins to be created by the US Mint. It was actually the first .9999 fine gold coin ever struck by the US mint and today there are two types in production: 1 oz non-circulated bullion example which is traded for a small premium over the gold content; and a second version specially minted for the collector market. The coin has been minted since 2006 and is continues to sell very well. 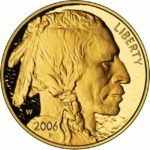 There are a number of reasons that the American buffalo 1-ounce gold coin is so popular. The first is that it has a worldwide appeal. That is partly because the weight and purity is guaranteed by the US, making it a smart investment. It is also a popular retirement account choice. Moreover, this coin is very widely available and very popular for that reason. Large dealers will post daily buy/sell prices making it easy to trade while special plastic protective sheets are sold in order to make transportation and storage of the coin that much easier. The US Mint ships bulk orders in boxes meanwhile, which contain 500 coins each and can also be easily stored. When buying these coins as an investor, you can decide whether you want to buy sheets that are stored flat, or whether you want them in the plastic CoinSafe tubes. All in all, the American buffalo 1-ounce gold coin is a great choice for any investor. This is a highly popular coin that is widely available and very easy to buy and sell thanks to the readily available information regarding value. What’s more, is that the coin is very attractive and a nice collector piece to own. This is a coin that is actually sold as a collector piece, as well as an investment opportunity, which should give you some idea as to the attractiveness of this particular design. This is a great way to invest your money, particularly during a difficult economic crisis. Gold is one of the only assets that is ever likely to go up during a recession and when you consider that alongside the inherent appeal of such an iconic coin, you have an excellent option for investing your cash! A brilliant way to keep your funds safe.